Militants made an abortive bid on the life of Jammu and Kashmir Chief Minister Farooq Abdullah when they fired rifle grenades towards the venue of a function attended by him here this afternoon. Do you feel that tension on the Indo-Pak border has decreased in the last few days? The BJP-led NDA government will send a team to Punjab shortly to make an on-the-spot assessment of the general law and order situation in the state and whether there has been a dangerous rise in political violence and vendetta. This assurance was given to SAD chief and former Punjab Chief Minister Parkash Singh Badal when he called on Prime Minister Atal Behari Vajpayee here today. Officials from the US Federal Bureau of Investigation (FBI) are reaching Pakistan tomorrow to assist in investigations into a car bomb explosion in Karachi yesterday that left 11 persons dead. NATIONAL CAPITAL REGION: Delhi Govt says cheers! Two persons, including an Army jawan, were killed and 24 others, of whom 11 were Army men, sustained shrapnel injuries in Pakistani shelling on frontier Indian positions at Kalsian, Digwar, Khari Karmara, Bandi Chechiyan, Mankote and Jhalas areas in Poonch and Nowshera sectors along the Line of Control (LoC) since late last night. 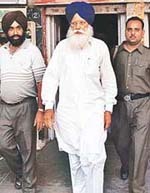 The Punjab Vigilance Department today stated that former Education Minister Tota Singh, during his tenure in the previous Akali government, amassed property worth over Rs 17 crore. Where did we lose that proud Punjabi spirit? No vigilance raid, no investigation, no arrest orders. This may be a conspiracy to ruin your political career! The Vigilance Bureau, with the help of the local police, today raided several places in Nihal Singh Wala, Badhni Kalan and here looking for close associates and members of the family of former Education Minister and MLA Tota Singh. The state-owned Indian Oil Corporation, Bharat Petroleum and Hindustan Petroleum have decided to raise the retail selling prices of petrol and diesel by 23 to 30 paise per litre, effective tonight. In the wake of a rapidly deepening coal crisis in the thermal plants of the state, Punjab may face major power cuts and closure of some thermal units by the end of June if timely steps are not taken by the PSEB management. Today, all three thermal plants have limited coal stocks which are sufficient for just four to 10 days.